The Forest guards are expected to invigilate and notify about the happenings in forest, these brave heroes walk through the jungle and in the name of defence get only a Lathi (A long wooden stick). An average meal course is something that by far stays a luxury for them as they bank on the minimal Roti, Onion and Green Chilli…PHEWW life would have been so difficult if I had to live on that kind of food and still work with equal passion and sincerity like one of these valiant guards. I have just randomly googled for the duties of a Forest Guard and came across a list of responsibilities through Andhra Pradesh Forest Department’s Website. There may be some alternations in the nature of duties in different states in India but I believe most of the rules are similar to this list. Let us check it out. # He knows the boundaries of his Beat thoroughly and prevents encroachment, and protects his Beat against injury from fire or other causes. # He should petrol the forests constantly in his Beat to prevent offences, and where the offences are detected he must record the offence promptly to Range Officer. # He should maintain the boundary lines and boundary marks in forest blocks in proper order and repair. # He should cut creepers and climbers during his perambulation in the Forests. # He should keep the sign boards and name boards of forests, plantation in good condition and repair. # He should check forest produce in transit and see that the forest produce is not removed except in accordance with the transit rules. # He should control and supervise over such of the works as ordered by Section Officer and Range Officer. He should carry out Silvicultural works such as sowing, plantings, nursery works, Collection of seeds, Creeper cutting, pruning, thinning and other cultural operations as ordered by Section Officer and Range Officer. # He should affix on illicitly cut stumps of trees in the forest, a hammer mark prescribed for the purpose, make a note of the exact locality, description and number of such stumps in his diary book and report about them to the Range Officer. Where such hammer marks are not found and when to reference to the report made can be produced, it will be presumed that the Forest Guard has failed to petrol and perform his functions properly. # He should submit all his reports to the Section Officer and the Range Officer promptly and submit his weekly diaries promptly. Unfortunately, most of us would be uninterested in learning about the lifestyle of a forest guard, on our trips to national parks in India; we will hardly notice the role of forest guard and will do least to gather information on it. However, this brave league of men play a vital role in wildlife tourism, AND how does a forest guard is a useful source? Well, he is someone with distinct and detail knowledge of the core areas of the forests. They are guides to imminent photographers, naturalists and botanists, who you often catch on your TV screens and read about their research on various wildlife magazines. 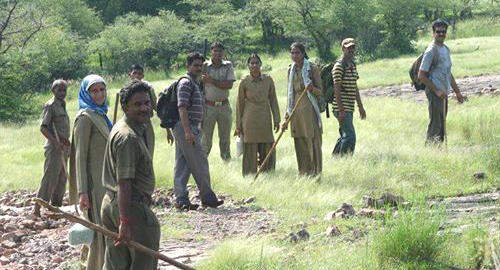 Despise their tough lives, these dedicated people put their heart and soul in serving in the different national parks and wildlife sanctuaries in India. 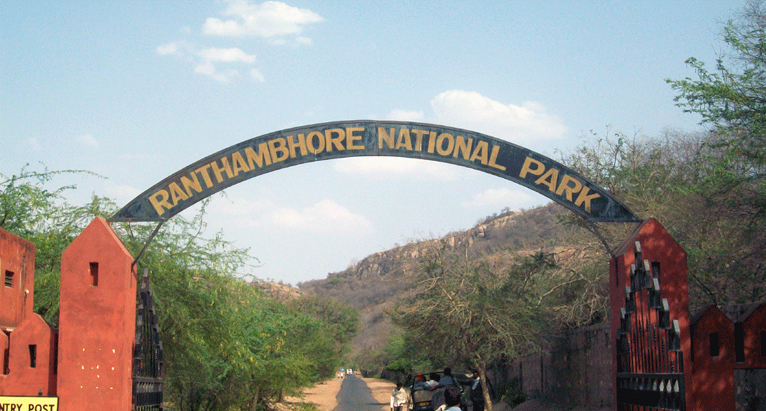 It was in October 2012 when the news came in from Ranthambore National Park, where a young male tiger attacked a forest guard named Gheesu Singh and then dragged him 50 feet inside the dense forest. The brave guard was on duty when he encountered a tough battle against the wild beast, I can’t blame the tiger for being born as a predator but I strongly condemn the incident. Unfortunate incidents like this one are the part and parcel of the Jungle domain; however what strikes me the most is the dedication with these gallant men performs their duties. Their courage is worth mentioning and being inspired from. There are plenty of cases FOR THAT MATTER where the forest guards and other personnel were either confronted by smugglers and poachers in the forests in India… HUMANS are indeed the most dangerous species that we have bigger battles with! You shall be amazed if I tell you that with the help of their Lathis these brave guards despite have been able to forced many poachers and smugglers to withdraw their intentions. Indeed these forest guards despite of the adverse conditions do not forget to serve their duties right! AND it is high time that we should come up with the solution for their protection and rights along with the safety of animals and their natural habitat. 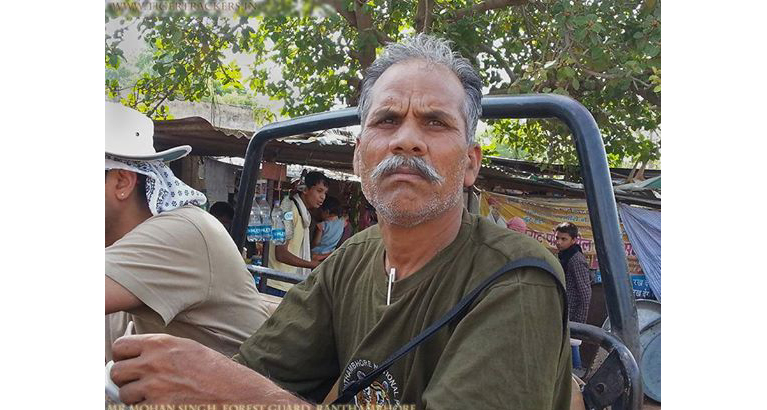 I would like to share about Rajeev Singh, from the league of brave men, a Forest Guard in Ranthambore National Park, who stand firm for anti-poaching and has expertise at rescue and rehabilitation of wildlife, also he once saved the life of a Forest officer from the tiger and helped in tranquilizing the strayed wild cat. There are similar incidents that happen every now and then in some or the other national park in India that make one to salute these unsung heroes. Unfortunately, there are minimistic chances that we will ever come in contact with a forest guard in a national park or in a wildlife sanctuary…BUT…there is something that we can do for these unfortunately overlooked heroes. Their dedication, zeal and devotion deserve to be appreciated and shared. No matter if they go unnoticed; we want to show our respect for their work and dedication. Let us all SALUTE to these Forest Heroes and condemn poaching, smuggling and raise voice for their protection and for their other rights.